Identification: Geographically variable. Antennae are dark. Females are larger than males. 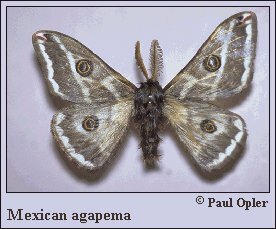 Upperside of wings ranges from gray through grayish brown to brown. Female hindwing is mostly gray. In males the forewing eyespot often touches the median line. Black mark at the forewing tip runs parallel to the median line. Wing Span: 2 3/8 - 3 5/16 inches (6 - 8.4 cm). Life History: Females lay large groups of eggs on the host plants. The eggs overwinter and hatch from January-April. Cocoons are spun in branches of the host plants during April and May. Flight: Emergence peaks from October-November. Caterpillar Hosts: Knife-leaf condalia (Condalia spathulata), green snakewood (Condalia viridis), and javelina bush (Microrhamnus ericoides). Habitat: Desert foothills, arroyos, plains, plateaus, and alluvial fans. Range: Southern Arizona and southwestern New Mexico; southeastern New Mexico and west Texas; South Texas plains; and Mexico.